A brawl broke out at Jingu Stadium during a game between the Hanshin Tigers and Tokyo Yakult Swallows near the tail end of the 2013 season. It was a typical baseball fight, so beyond a round of spirited pushing, players being held back and an assortment of shouts hurled back and forth (“That’s fertilizer. That is fertilizer,” Dodgers broadcasting legend Vin Scully might’ve translated). The catalyst for this was a play at the plate. Tigers outfielder Matt Murton had rounded third, headed home and barrelled into Swallows catcher Ryoji Aikawa, who had just received the ball. 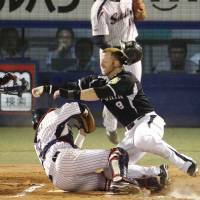 Aikawa, who had already missed two months that year after a similar play, was predictably miffed about being run over and gave Murton a shove which brought both teams out of the dugout. Murton, however, didn’t feel he’d done anything wrong, he just wanted to knock the ball free, which was within his rights to do, and score a run for his team. Aikawa had held onto the ball, so Murton was out (in more ways than one as both players were tossed because of the fight). It wasn’t the first home-plate collision for either player that year, and there had been others, including one that resulted in an injury, involving different players. These are the types of plays Japanese baseball will try to eliminate by agreeing to crack down on players running into catchers and enforcing rules preventing backstops from blocking the plate without the ball. The rule changes mostly mirror those MLB made in 2014 to improve player safety. Players will have to adjust to the new environment around the plate, but the onus will be on Japanese umpires to get the ball rolling during the spring. If the new rules applied to the aforementioned meeting of the minds between Murton and Aikawa, umpires would’ve had to determine whether Aikawa was blocking the plate, or Murton careened into him needlessly, or if neither of those things happened. That’s going to be a lot for the umpires to handle — as it was for MLB umps in 2014 where there were a number of gripes from confused players and managers concerning the application of the rule and mixed messages coming from the league office. So Japanese umps will need to be on their toes and be as clear as possible, even though no two situations are exactly the same, about what goes and what doesn’t. That, of course, means taking off their blinders when it comes to catchers. Many Japanese baserunners generally avoid home-plate collisions — it’s usually been foreign players, Westerners mostly, who come from leagues where physicality at the plate was more accepted, who ram into catchers, which was within the rules. Japanese catchers, on the other hand, will often stand guard at the plate without the ball. So a renewed focus on the existing rules will likely come as a rude awakening to some, at least early in the season. There are going to be some mistakes in applying the rules, perhaps (but hopefully not) even some that effect the outcome of games. There were growing pains in the majors as well. There is also no way to totally eliminate collisions, because sometimes things happen. Player safety is paramount, however, and if umpires are up to the task during the spring and early in the year, there will be a smooth transition.